Although a great fan, believer and follower of Baba from 2006, the day I started working for Mahaparayan many positive things took place. Just when I got one group of 48 people, Hetalji honoured me to be the editor of the sacred blog(http://www.shirdisaibabaexperiences.org/). Later inspite of my husband’s and in-law’s will but as it was Baba’s will, Baba convinced them to allow me to work. Just then I came across a Baba’s image, “As Long As You Know That Sai Is For You, It Doesn’t Matter Who Is Against You” and was fully convinced about it. Also in June or July, my son was told to undergo a small surgery for Hydrocele during his Diwali vacations. But I had faith in my Sai and kept applying Udi and did Nav Guruvar vrat for him. So due to Baba’s blessings surgery was not required and doctor also confirmed that Hydrocele had gone on. Sneha my devrani (sister-in-law), always says that no matter how many Sai Satcharitra we get, we always fall short of it and so quickly they get over. How true it is, I realised after she said so! When Chavadi group was being formed and was going to be executed on a Thursday, I had failed to manage the books from the source which was planned. It was a Sunday and I then said Baba relying on You I said very confidently to all about not to worry for books and that they would get it before Thursday. Now what shall I do? Reading from pdf files is not comfortable to all. You will have to do something Baba. Just then I came to know about Neetuji going to Shirdi from her facebook status which was another miracle as fb status we never pay any heed to. But Baba in His own ways, shows us the ways! I contacted her and requested her and that night itself Baba arranged 51 Sai Satcharitra straight from Shirdi through Neetuji. 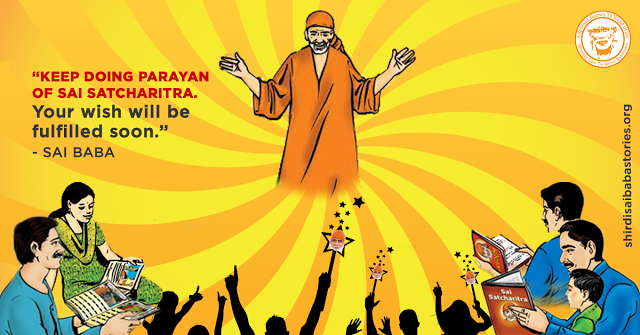 Wouldn’t you now say that Baba was providing everything that was needed! I registered for Mahaparayan to read two chapters every thursday and received the confirmation e-mail. But after that I haven't been contacted or added to any Whatsapp group as mentioned in the e-mail. Since, the date to commence Mahaparayan is nearing, I just want to make sure I'm included in this mahayagnam. Please, let me know the proceedings! Same here, I registered for the parayana and got an introductory email and after that nothing; Can you please include me in the mahaparayana. Very Nice Blog and goosebumps while reading . Lucky are the people who experienced these miracles. I have registered in MahaParayan . Hoping BABA will give me a chance to be part of this wonderful event .